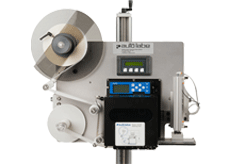 The new Model 155 Print & Apply Label Applicator incorporates an Allen Bradley Micro Logic PLC. This allows superior versatility and control for a wide variety of user applications. The LCD display screen enables easy view menus for programming and troubleshooting. The Model 155 is available for Tamp, Blow, or Wipe-On configurations, and can be customized with several options. Datamax with 203 or 305 DPI print resolution. 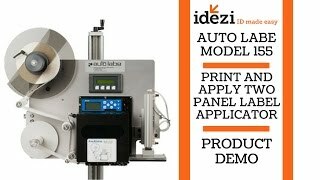 Auto Labe’s new Print/Apply System integrates either a Tamp-On, Blow-On or Wipe-On Label Applicator with High Performance Thermal Transfer and Direct Thermal Printers. The Model 155 incorporates an Allen Bradley PLC for easy menu driven operation and control. No more relays or circuit board problems to worry about. Built to last with only the best components available for maximum versatility and performance.